TONIGHT!!! #LetFreedomRingDC at Bistro Bistro 11p-3a!! 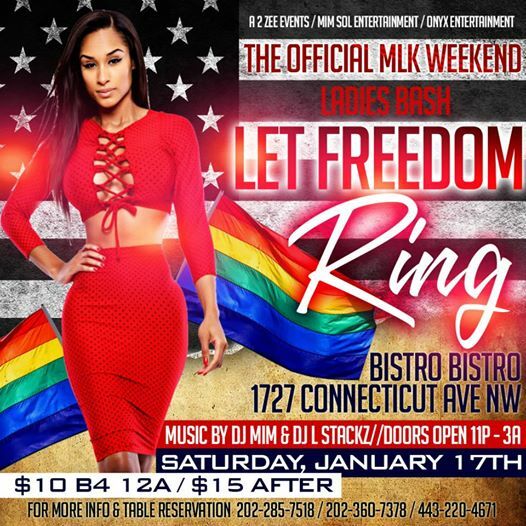 The OFFICIAL MLK Weekend Ladies Bash “LET FREEDOM RING” at Bistro Bistro! Saturday, January 18, 2014 11p-3a Get READY to PARTY for the 3 day MLK Weekend in DC with 100’s of beautiful WOMEN, 3 of your favorite Lesbian promoters, 2 HOT Lesbian DJs and a sizzling Lesbian web series cast! !